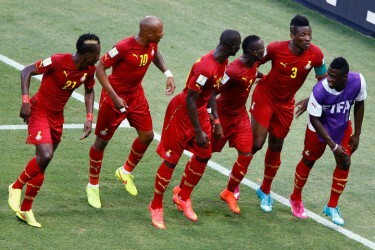 Ghana ended their World Cup campaign in disgrace over bonuses. Some blame administrators, some blame the players. The truth probably lies somewhere in-between. The issues surrounding that dispute are being addressed with a Government enquiry but when it comes to the actual football it doesn’t feel like much has changed. Sulley Muntari and Kevin-Prince Boateng have been suspended for disciplinary reasons, although most of us know the latter was never going to make an appearance until 2018. Adam Kwarasey has also been dropped after criticising goalkeeper coach Nassam Yakubu’s training methods. Kwarasey claimed Yakubu made him “dive around all day” and Yakubu’s preference for Fatau Dauda over Kwarasey during the last international cycle seems to back up that statement. Dauda loves to fling himself about and make spectacular saves despite lacking in backing goalkeeping fundamentals. Yaw Frimpong is the only player who could earn his first appearance for the Black Stars after an injury to Daniel Opare, but that still seems unlikely. Abdul Baba Rahman and Jeffrey Schlupp take their places in the squad as the two left-back’s, a welcome change after Kwadwo Asamoah, Ghana’s most creative player, and a series of right full-backs filling the spot needlessly. Kwesi Appiah will get praise if either player performs well, but Rahman and Schlupp have been performing well at a good level for some time now and it would simply be a corrected mistake. With two capable young left-backs in the side Kwadwo Asamoah should be able to take up his favoured central midfield position alongside Mohammed Rabiu, but everything else should remain the same as before. The team will still be sharp on the counter with Andre Ayew, Christian Atsu, Abdul Majeed Waris and Asamoah Gyan almost operating as a front four. That, coupled with an aggressive pressing style, should be enough for Ghana to earn a win, but the Black Stars do struggle to break down organised defences. After transitioning from Bobby Williamson to Milutin Sredojević Uganda are well drilled and could make fans nervous at the Baba Yara stadium if they can go into half-time at 0-0, causing Ghana to run out of ideas and leave gaps at the back. Sredojević seems to have confidence in his side. “I have done my part, now go for exams. I am confident you will pass,” he has told his players in the run up to the match. The Serb knows his team are underdogs but thinks this will be a good indication of how his team have progressed during his tenure.